MINSK motorcycles, also known as M1A or M1NSK, are an ex-soviet brand of motorcycle. Originally, manufactured in Moscow then the factory was transferred to Minsk, the capital of Belarus in 1951, therefore, it was renamed MINSK from M1A. The MINSK motorcycle then rapidly gained popularity in the USSR, East Europe, the Warsaw Pact countries, China, Vietnam and western Asia. Spreading out with the extension of Communism and the geostrategic and ideological influences of the USSR they have been delivered to and sold in 45 countries and the total number has exceeded 6.5 million. The first MINSK’s arrived in the North of Vietnam at the beginning of the 1960’s, following the support of the USSR and the Warsaw Pact during the Vietnam war. Later on, the MISNK motorcycles were officially imported to Vietnam in the following decades from the 1970s to the 1980s. That’s why during this period of time the image of MINSK motorcycles in the eyes and minds of the northern Vietnamese stood for the kind-hearted, wealthy, generous, creative and hard-working Soviet and Communist friends. Also, according to the Northern Vietnam government’s propaganda, along with the hammer and the sickle on the communist flag the MINSK motorcycle stood for working-classes, the pride of communism technology and creativity as well as a good friend of the working-class. In contrary to the girly and lazy Honda and Vespa scooters which stand for capitalism and imperialism. For many decades, from the beginning of the 1960s to the end of the1980s the MINSK was the most popular motorbike in Vietnam, just like the Honda scooter is now. It was the most valuable property and the sweetest dream of most Vietnamese families and they have become the best friend of any Vietnamese person, from a peasant to a doctor or a politician. Things changed quickly as a result of the collapse of the USSR, the dissolving of the Warsaw Pact and the decline of Communism at the end of the 1980’s. On the other hand, in 1994 the USA lifted the trading embargo for Vietnam and the country was allowed to open its doors to the world, of course, the influx of dozens of other shinier, more elegant and more comfortable motorbike brands came to Vietnam. As a result, the image of the heroic MINSK motorcycles was also fading with the collapse of communism which made way for the lazy and girly Honda, Vespa, Yamaha scooters and even the cheaply Chinese ones. When having no choice, the MINSK was the best. But when having more choices, Vietnamese people suddenly turned back to the MINSK and fell in love with the young, shiny and beautiful girls like Honda, Vespa, and Yamaha. As a result, the old, hash and rough lady like the MINSK was abandoned and cheated. Poor the MINSK! Gradually, almost people turned back to the MINSKs and it is said that there is no reason to ride such heavy, ugly and dirty motorcycles in the city and there is no room for it in the house. Most of the MINSKs were pushed to the construction work to suffer with the “life of slaves” and labor exploitation, carrying anything and everything from the construction materials like sand, bricks, concrete and timber to chicken, pigs and buffaloes. You name it, they carried it! The rest of the MINSK motorbikes were taken to the remote areas, rugged mountains and terrains with dirt tracks and off-roads where they had to work hard but were being treated better than the slaves in on the construction sites. However, the people in the remote lands just considered MINSK motorbikes as iron workhorses. From the status of a hero, a legend, suddenly the MINSK had to bear with the status of a worker and a slave. Because of hardship, over-used and under-maintained conditions, most of the MINSKs were found dead in the recycle storages or villages. Nowadays there are very few MINSK’s left, it is estimated that there are about 3000 MINSKS left in Vietnam and most of them have been wounded or disable! What an eventful life story of the MINSK motorbike in Vietnam. It came with glory, grew up with poverty, died with memory and reborn as an immortal legend…Though most people have turned back to the MINSK, the ones that were born in the 1970’s and 80’s could not forget the MINSK as a red page of their lives. The image of a rough motorcycle- a workhorse is forever in our mind and reminds us about the glory time of Communism in Vietnam under the subsidy economy! We are happy to know that the few young people in Hanoi and around Vietnam still love the MINSK. They ride them with love, passion and respect! Throughout Vietnam, the biggest and craziest motorbike fan clubs are the Minsk Clubs. Recently, there has been an amazing rebirth of Minsk motorcycles. The wounded Minsk in the recycle stories and villages has been rescued and reborn to become immortal and legendary motorbike in Vietnam. We are proud to be official members of Hanoi MINSK Club, there are about 200 members and we all have love, passion and respect for the MINSK, that’s how we got to know each other. 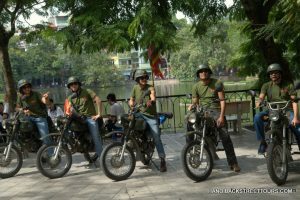 As nostalgias we strive to preserve and enhance these antique motorcycles and we would like to share our love, passion and respect for the MINSK with you our beloved customers to make an impactful and unforgettable experience for you about Hanoi and Vietnam and our people through the legendary ride of a MINSK. Fact and figures about motorbikes in Vietnam and 8 top-reasons why you should take a motorbike ride when traveling in Vietnam . Simply, being a ride-pillion passenger on a motorbike at least once in your lives. 1. Motorbikes are the most convenient means of transportation; used by most Vietnamese from the infants to the 100++ year-old. 2. It is NOT that dangerous as you think to take a motorbike ride or a motorbike taxi ( Xe Om) in the big cities like Hanoi or Ho Chi Minh city. Let ride Minsk & enjoy “school of fish” traffic in different way. Hassle and panic free to experience a motorbike ride when you are in the cities. 3. It is legal to carry an adult ride-pillion passenger and as many children as you can on a motorbike. But it is illegal to carry 2 adult ride-pillion passengers on a motorbike. 4. It is also legal if you carry anything and everything on a motorbike and one more ride-pillion passenger in the back. 5. Vietnam is a home of Motorbike; it is the 4th world largest motorbike market after China, India and Indonesia. 7. Until 2016, Vietnam has had 40.5 million registered motorbikes, equivalent to 2.4- 2.5 persons per unit. 8. It is estimated that there are about 5 million motorbikes are driving in Hanoi and 6.5 million in Ho Chi Minh City every day.